Ever since we lost Harris Teeter, I have been on a quest for the perfect cold Sesame Noodles. They are one of my favorite things that I have never been able to get right? And here is how I did it! I took bits and pieces from my inspriations and put my own recipe together that I am going to share here with you! 1 lb thin spaghetti, cooked al dente’ as the soy breaks down the noodles and they will get gummy. Mix everything together, taste for seasonings. This will make a ton of dressing but, please trust me the noodles will absorb the dressing, and you need it! set to 400 and timer for 25 mins. Your welcome in advance! This is a keeper!! 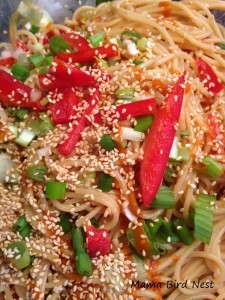 This entry was posted in Asian, Meatless Monday, pasta.